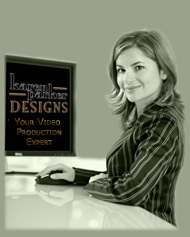 Karen Parker Designs offers professional video production services for a wide variety of projects. We will take your project from the early stages of pre-production by planning and developing your concept, through production with camera and lighting set-ups, to post-production editing. We will plan, develop, and deliver any size project including music video, training videos, interviews, real estate virtual tours, documentary video and more. Pre-production: planning, concept development, script, shot lists, storyboards, art direction, location and set design. Production: cast, camera crew, lighting, sound, and equipment. Post-production: video editing using Final Cut Pro, special effects graphics, motion graphics, animation, sound mixing, voice over and printed to DVD output.